TOKYO (AP) — The PGA Tour will hold its first official tournament in Japan. 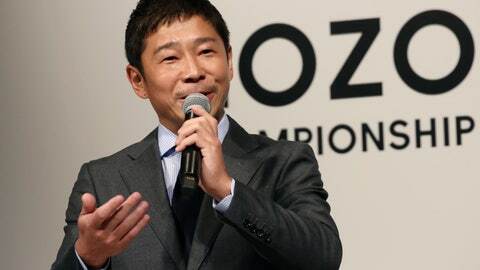 And the main sponsor of next year’s event, Japanese billionaire Yusaku Maezawa, is describing it as a kind of “moonshot” for golf in his country. The founder of the Japanese fashion website Zozotown, Maezawa was announced earlier this year as the first commercial passenger to attempt a flight around the moon. Japanese golfer Hideki Matsuyama was sitting alongside Maezawa during the media event at a central Tokyo hotel. “I don’t know whether he will ask me, but I would love to go (to the moon),” Matsuyama said. The tournament, set for Oct. 24-27, will be part of the PGA’s swing through Asia along with stops in South Korea and China. The Japanese tournament replaces one in Malaysia. The PGA said it was a six-year deal, and driven partly by the 2020 Tokyo Olympics and golf’s high profile there. PGA officials said the Zozo Championship will have a purse of $9.75 million with a field of 78 — plus 10 designated by the Japanese Tour, and eight others with special exemptions. It will be played at the Accordia Golf Narashino Country Club in Chiba prefecture, just outside Tokyo. Maezawa said he was a “5-handicap” golfer at his best, but said he may have slipped to a 9-handicap — also a high level for an amateur player. Isao Aoki, who was the first Japanese player to win a PGA Tour event, was thrilled by the announcement. Aoki won in 1983 in Hawaii.